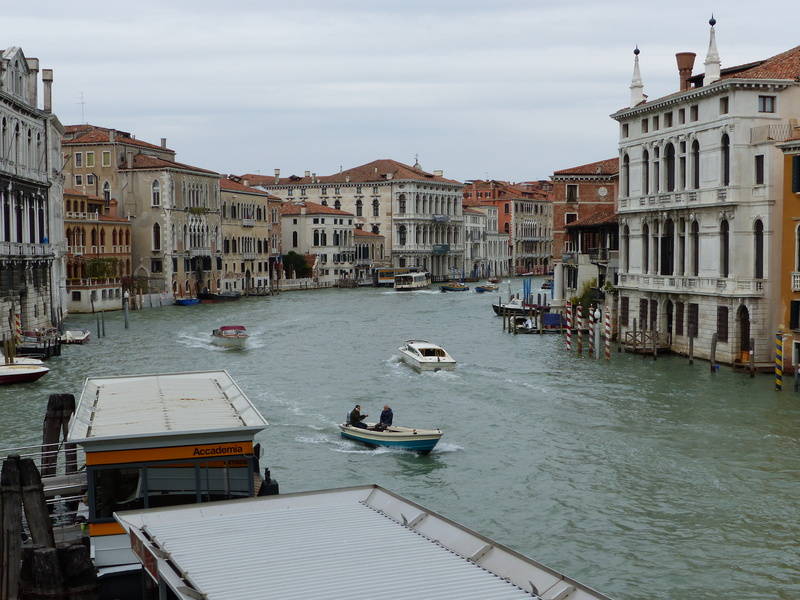 Venezia Vistas – Run. Ride. Roam. 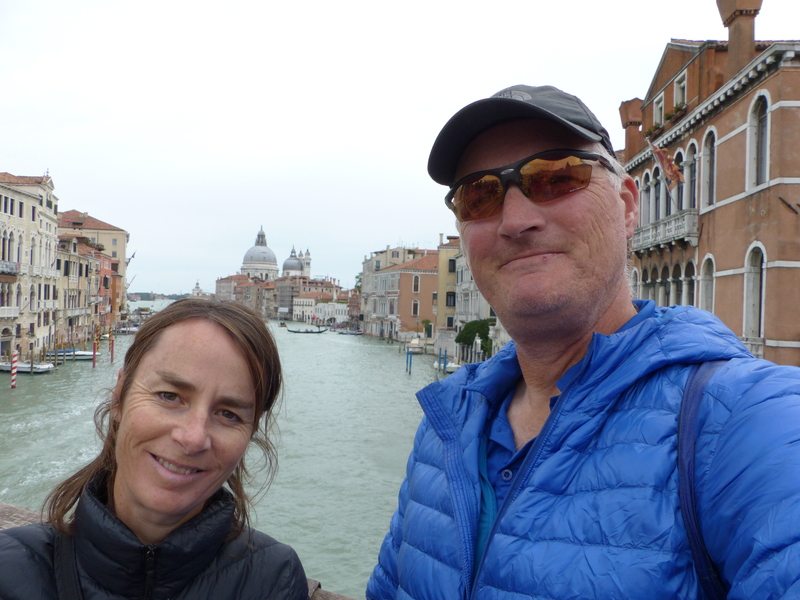 Our friendly hotel put on a magnificent breakfast spread for us, so we filled up on muesli and fruit and toast and headed out into another windy, chilly, grey day to continue our Italian adventure. 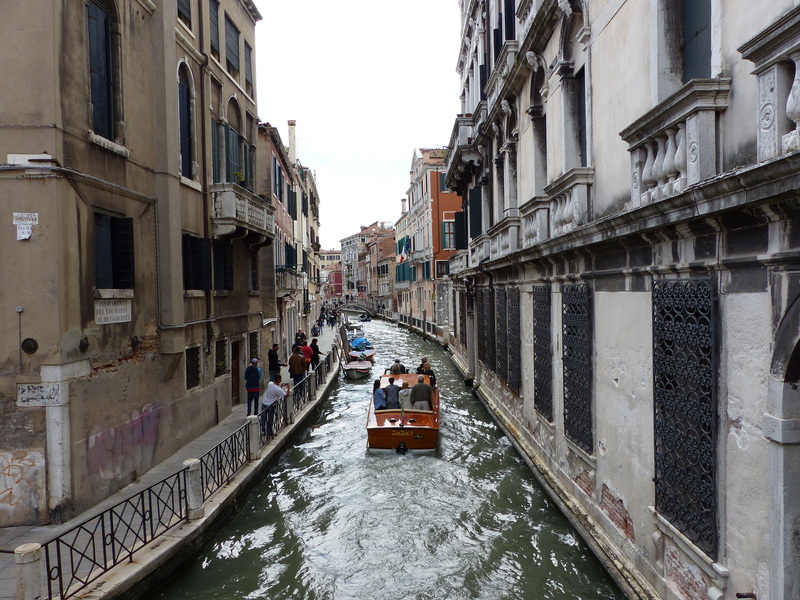 Venezia was ours to explore. We walked the short distance to the train station and on arrival, discovered that it was an unmanned station. Tickets…tickets…where to buy tickets? No staff. No ticket machines. Oh well, we’ll just have to try when we get on the train. After some waiting, the train pulled in and on we hopped. Just to be on the safe side, we turned to our translation app. I typed in “Sorry we don’t have a ticket. We didn’t know how to buy one. Could we buy one from you please?” and when the Italian translation came up, we kept it ready and waiting. When the ticket inspector came along, Steve held out the phone with the Italian translation of our words, for him to read. He scanned the text, smiled, nodded and assured us that yes indeed, we surely could buy tickets from him. He was very nice and very understanding and our tickets were bought and we instantly became legal passengers. It’s times like that I’m thankful for the invention of smartphones! 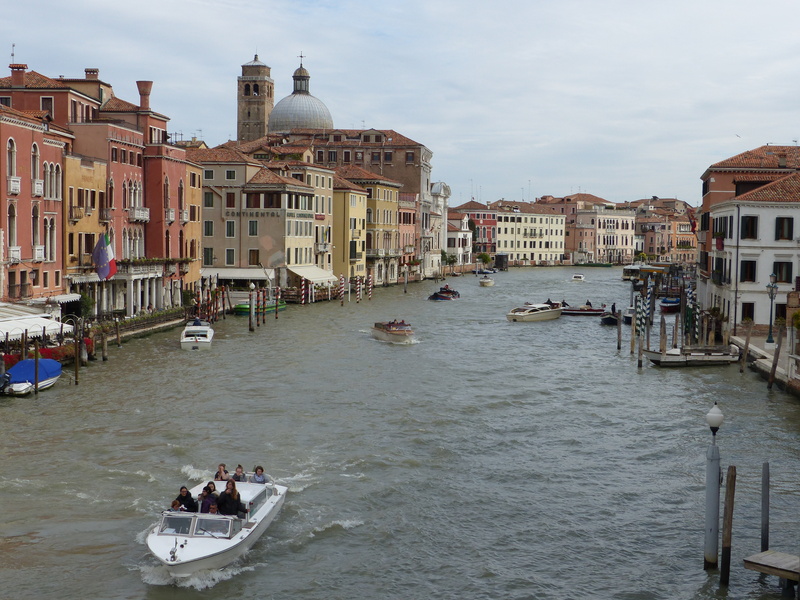 After a change of trains at Mestre, we choofed into Venezia (Venice) and joined the throng of tourists leaving the station and filling the streets. From there we began a day of roaming. Did we have a plan? No. Did we have specific destinations? No. Did we follow the crowd? No. 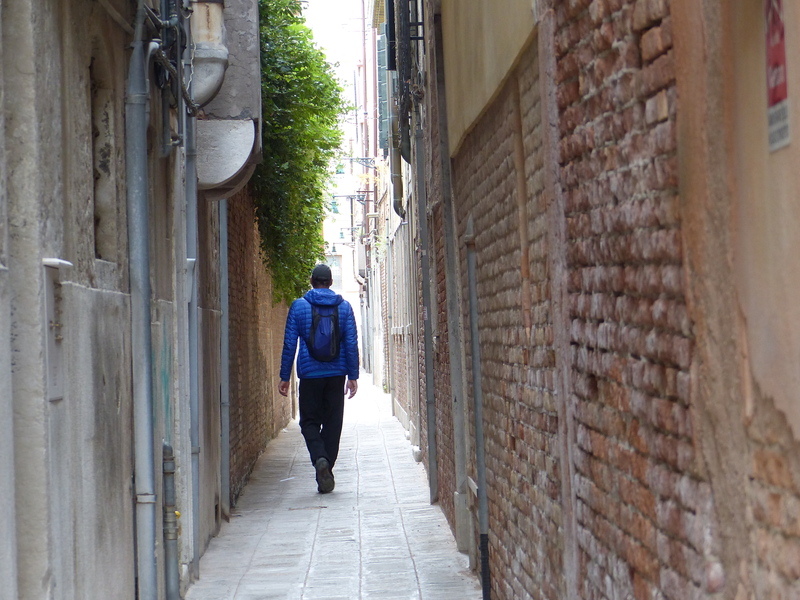 We just set off, wandering the back streets, ambling down alley ways and up narrows passages and lanes. 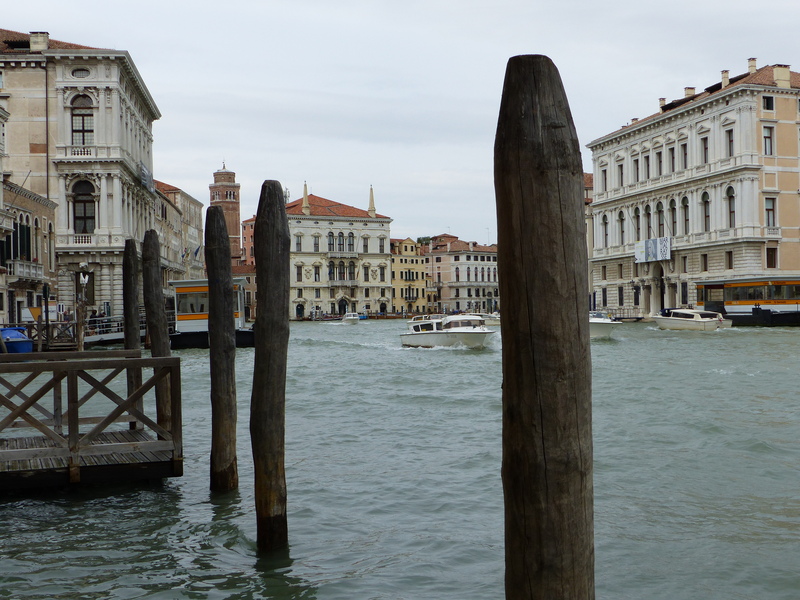 Within five minutes we had left the crowds behind us and found ourselves in quiets lanes, almost deserted piazzas and peaceful, waterside streets. We stopped at a bench in a small, quiet square and joined Pat, Penelope, Patricio, Pete, Pierce, Preston, Patricia, Polly and the rest of the pigeon gang and had elevenses, while our birdy company strutted and pecked around us. 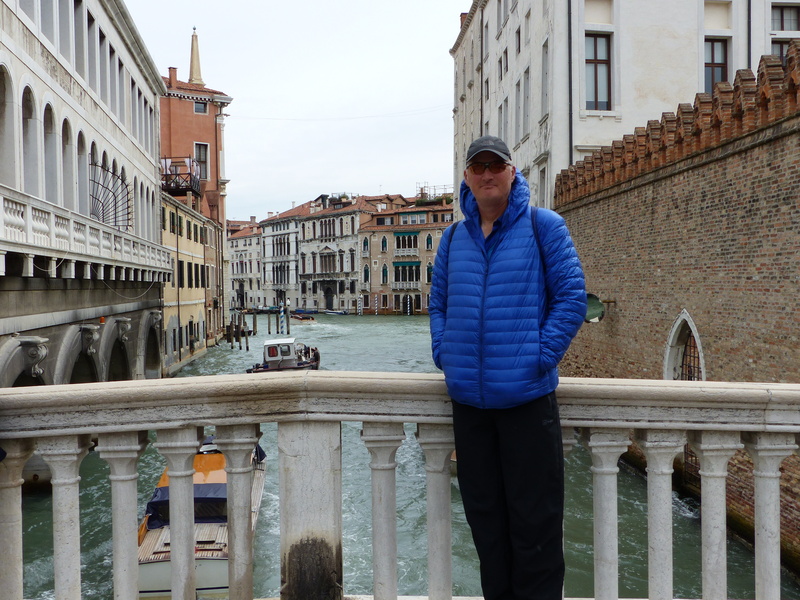 The day was then spent just roaming, wandering, strolling, gazing, wondering, questioning and exploring the streets and lane ways of Venice. This is a beautiful city, but we can’t admit to being captured by its spell. We didn’t have “wow” moments or find our surroundings breathtaking, as we have in some other places. I think we found ourselves viewing the city through a different lens. 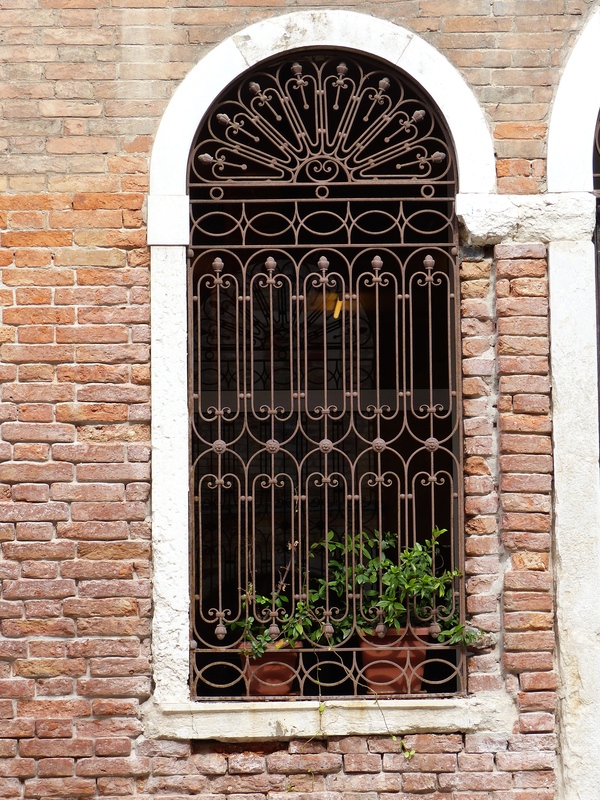 Like so many other places we have seen in Italy, Venice is a city in desperate need of some Tender Loving Care. 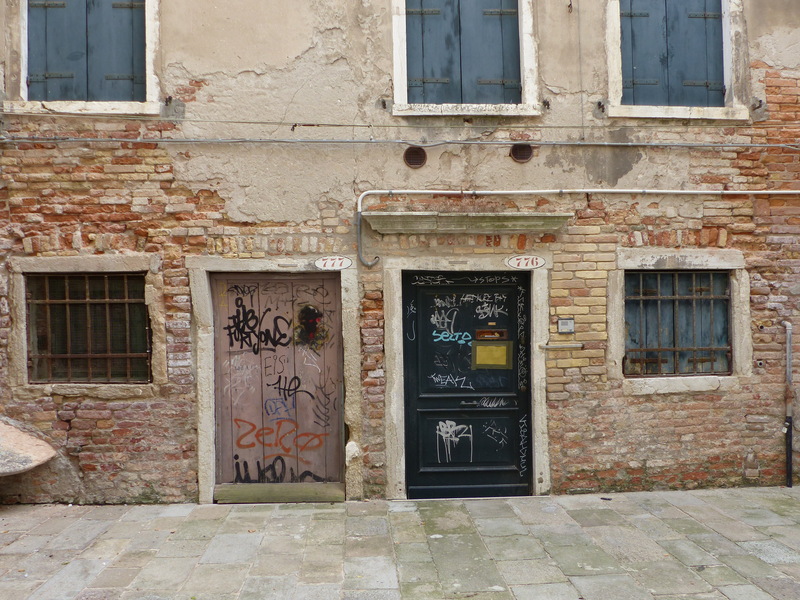 Buildings are in disrepair, the streets are in desperate need of a clean, graffiti covers almost every surface (we have never seen so much graffiti anywhere, as we have seen in Italy, it is absolutely everywhere, and every possible, available surface has been tagged, everywhere we go). 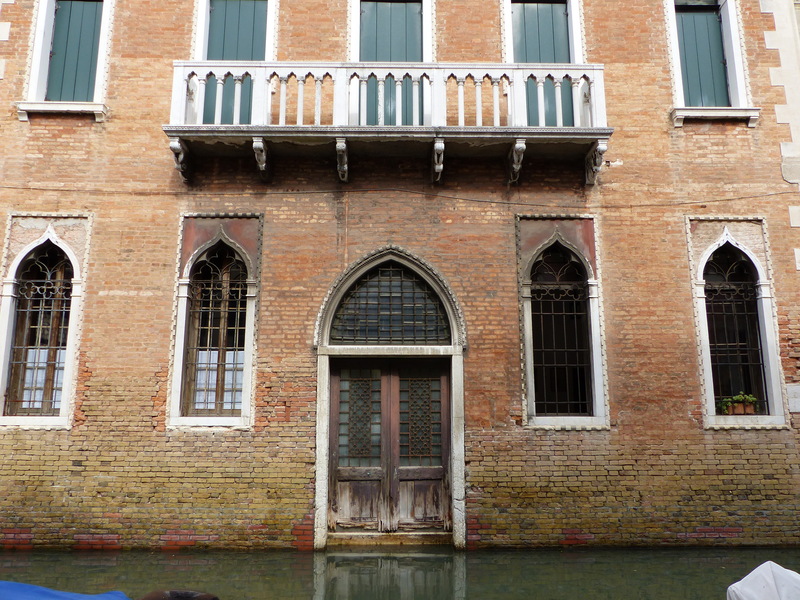 The views of the grand buildings and canals, that should be amazing, were clouded with the air of decay. It’s so very sad. I don’t think beautiful, historic places such as this should be modernised, but I do think they should be cared for and preserved. 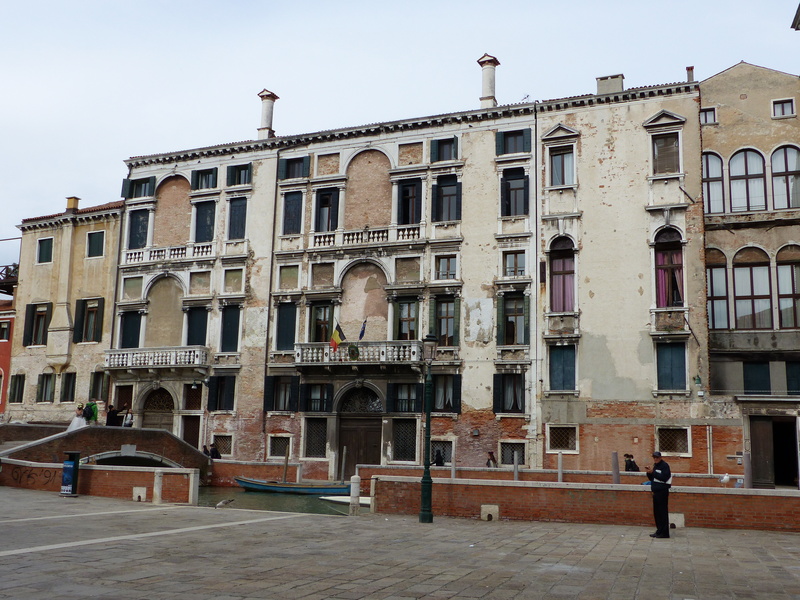 Venice, like the other towns and cities we have been to so far, in Italy, is in great need of care and preservation. It wasn’t just a case of a city being at the mercy of the water and the elements, it was more than that, it was a grand city, left to slowly, sadly, decline. 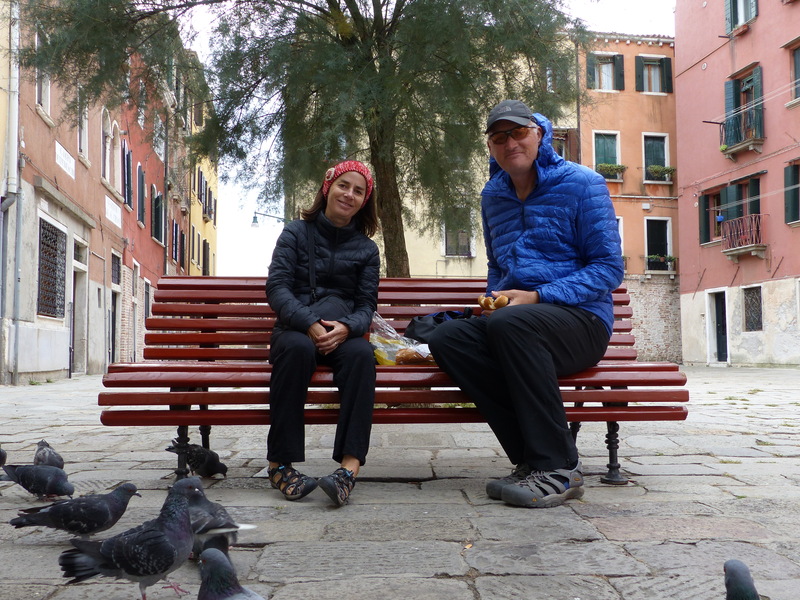 After a few hours of roaming, with many thoughts and questions churning in our heads, we stopped in another small piazza, sat on a bench with our friendly pigeons again and had some lunch. It’s always fun to people watch and we observed the comings and goings of locals and tourists and listened to the variety of accents floating past us. Then off we went again, roaming some more, around this grand and thought provoking place. We continued to get our bearings and our impressions of the city, making some plans for tomorrow, when we will continue our exploring. 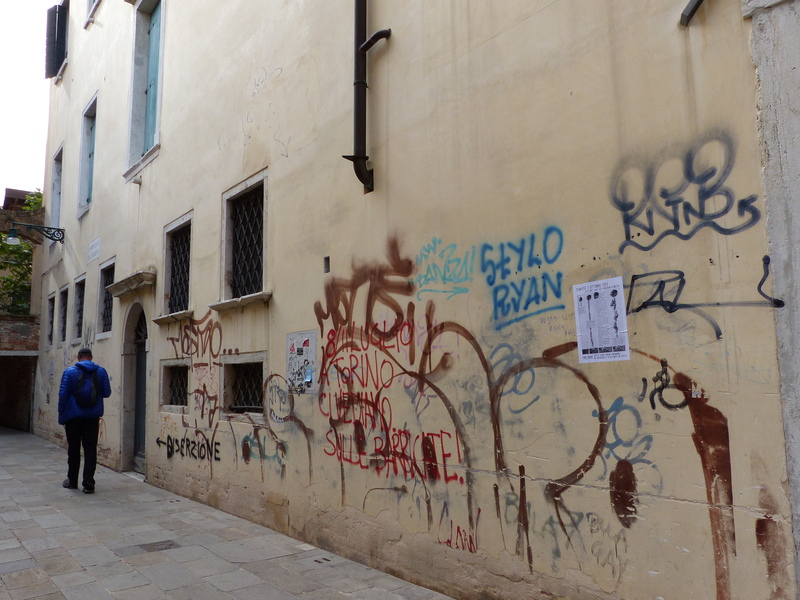 We didn’t have an agenda, we just free roamed, wandering this way and that, seeing an alley and walking down to investigate, turning up streets that were empty and dodging and weaving in the tourist-heavy parts of town. 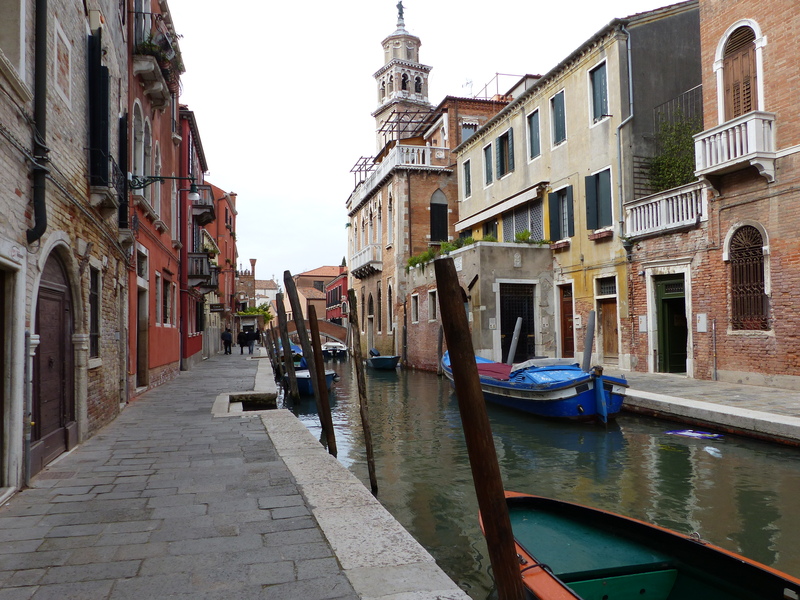 It was terrific and we saw the main sights, as well as the hidden backstreets and houses. It was our own version of roaming by improv! We had a really good day. We saw a famous city, we explored and discovered and thought and questioned and once again, felt a great sense of gratitude for the opportunity we have to be here. 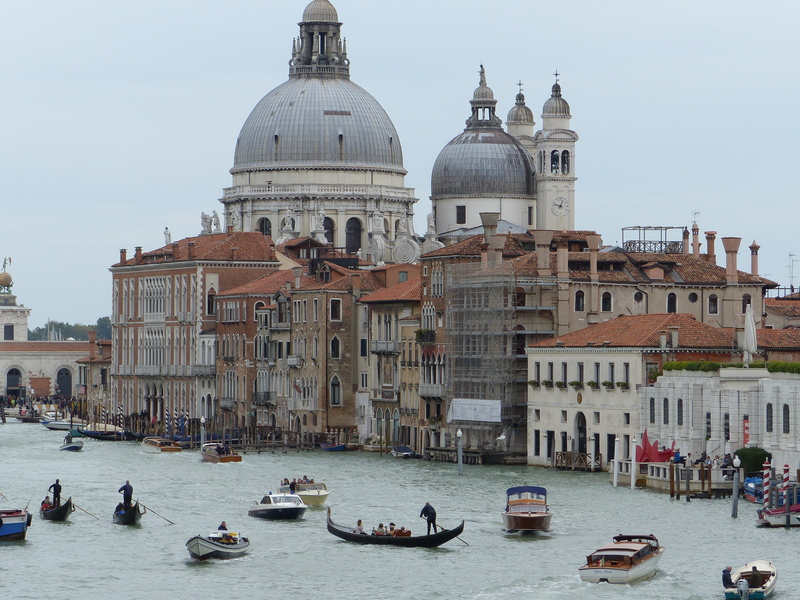 Tomorrow the roaming continues and we’ll explore a bit further afield to uncover more of the Venetian story. We are lucky indeed to be here, exploring the sights, sounds, scenes and senses of this famous, historic city. We will grab the opportunity with both hands, hug it tight and go forth once again with open eyes, open ears, open minds and open heart, to turn the next page on this great adventure of discovery. No need for a bookmark on these pages, we remember every moment! Boo Woo Woo, Get Outa Town! I didn’t have any really big wow moment either but still found the city spectacular. Did you go into the Basilica? 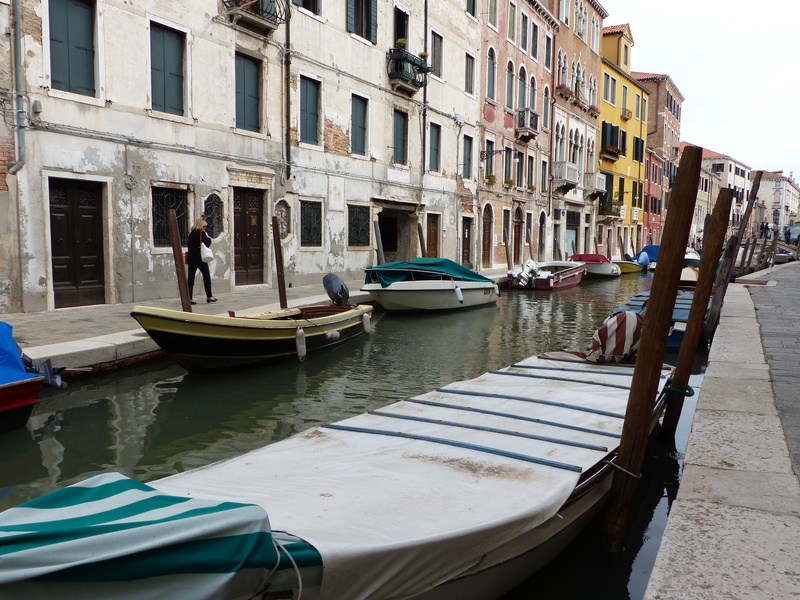 Also saw a glass blowing demonstration and went on a canal ride where the gondolier sang to us. Yeah, we went down the canal yesterday and went to the islands. Maybe our expectations were too high before we got here. It’s an interesting city but we just feel like we’ve seen nicer places, that don’t get the accolades, but have given us the “wow” moments. I guess that’s what travel is all about…being surprised one way or another!